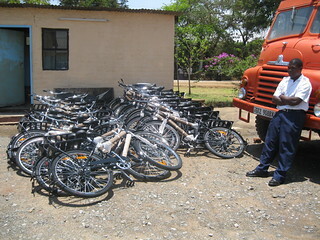 You are here: Home / ColaLife Trial / The bicycles have arrived! As a bit of bicycle enthusiast myself it gives me enormous pleasure that the ColaLife trial has the resources to provide the Kit Yamoyo promoters with bicycles. 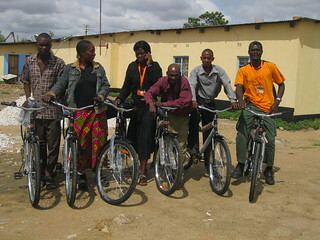 Because of the low population density of the districts we are working in (eg 16 people per square kilometre in Kalomo – that’s 6.25 hectares or 15.5 football pitches per person) promoters have to cover large distances in their work and a bicycle is essential. 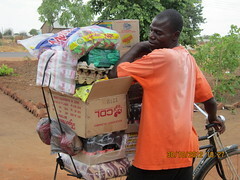 The bicycles arrived on Friday and that night I got a call from Bertinah – that’s the woman on the mobile phone in the picture above – to say ‘thank-you’. I did try to explain that the bicycles were not a personal gift from me! I’m not completely sure the message got through . . .
We have designed an incentive scheme so that the promoters will ‘earn’ their bicycles as the vouchers they activate and distribute are redeemed by retailers. For every voucher redeemed they earn one point and they need 300 points before ownership of the bicycle is transferred to them. There is also a ‘cash’ element to the incentive that will be paid in talk-time. The spreadsheet model we used to design the scheme is provided in the Excel spreadsheet below (you will need to go online to see – and download – this). 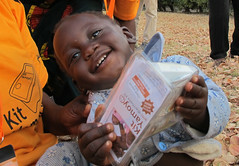 As always, we welcome comments, especially on the incentive scheme.